The Italeri kits are the old ESCI ones (including also a third kit armed with an AA 4 x 2,0 cm) and depict a flat bed truck and a medical Kfz 305. In the past they were also sold under other brands, such as Hasegawa, Revell or Polistil. 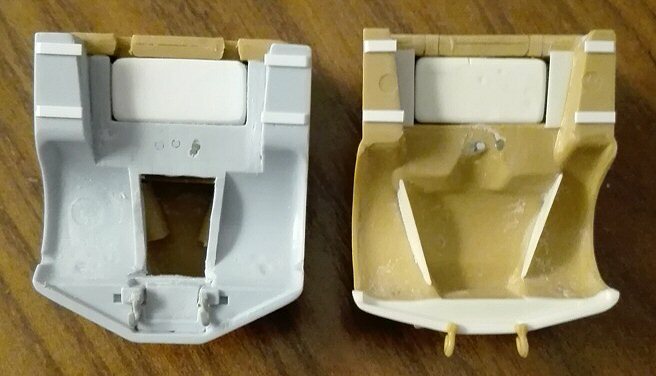 The moulds are either ochre yellow or light gray. 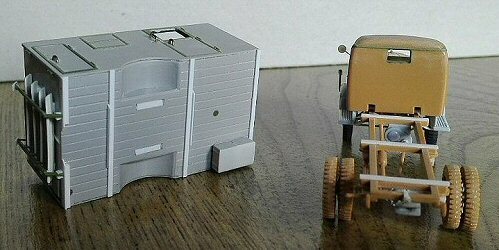 Each kit shares a common mould which has the chassis and the cab. 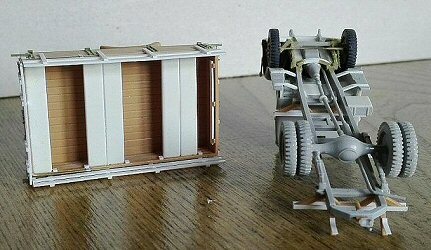 In the cargo truck kit, a second mould has the flat bed parts and three drum barrels for the load. In the “ambulance” kit on the other hand, the second mould has the parts for the box body. Besides these two moulds, each kit comprises a transparent sheet to cut out the wind screen and the windows, a well printed decal set and the instructions. The rear of the boxes has three colour profiles, nice to see. Close observation reveals the age of the kits. Some details seems to be shallow. 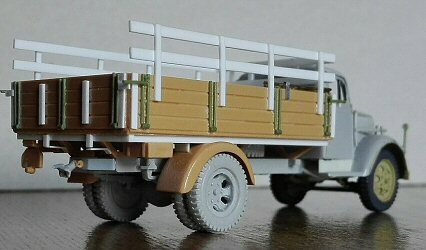 No benches are provided for the flat bed cargo and the “ambulance” interior is missing although the rear doors could be glued in the open position. The wheels, slightly undersized, are correct for the early production and, as far as I can understand from the photos I’ve seen, the later eight holes/eight bolts type depicted by Roden were retrofitted to the earlier vehicles making this the only real "mistake" of the kit. Furthermore they have three pin marks each and (worst of all) the rear outer ones had them on the outer side! The cab is a little undersized. However, this makes it compatible to the Airfix one as shown on a ML article . At the time those ESCI kits were released they looked fantastic and who was (like me) a teenager in the ‘70es was very happy to find a lot of tiny details. Nowadays a lot of people could have a different opinion, but these kits still have enough reasons to stay in the model shops shelves after 40 years. First of all let's see which variant is depicted by each kit. 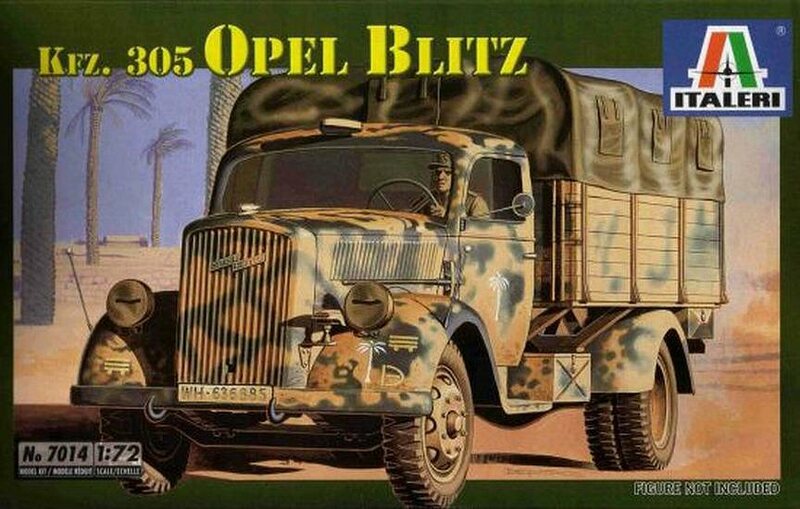 The Italeri chassis depicts the 4x2 Opel Blitz 3,6-36 S (S for Standard). There was also the 4x4 Opel Blitz 3,6-6700 A (A for Allrad - all wheel drive). Although they could look similar there were some differences between them and converting an S type in an A type doesn’t mean simply adding a drive shaft and a different axle. 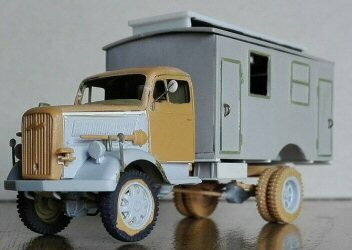 The wheelbase was 15.0 cm shorter (2.1 mm in 1/72) being the front axle shifted backward. This became well visible in the bonnet sides where there was a different space between the mudguards and the bumper. 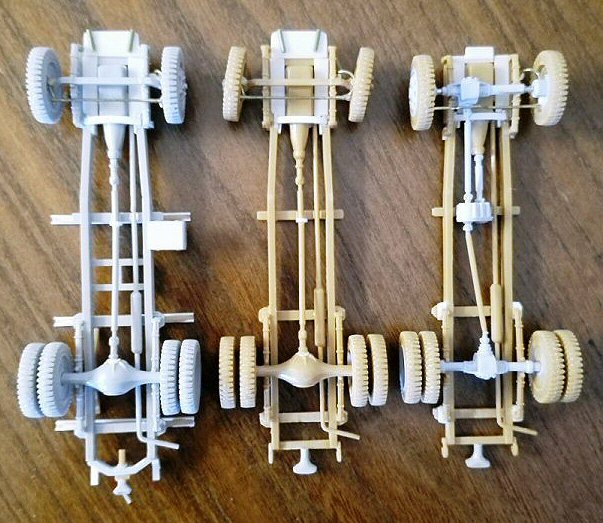 Although the kits longitudinal frames are straight, the real chassis forward part had the sides converging. The thing is quite visible in a naked chassis, but on the vehicle, the engine area hides most of this feature. The cab is, correctly, the standard one for the 4x2 truck, used until 1944, when its roof was modified to provide more room. From August 1944 it was replaced by the wooden cab depicted by the Academy and the MAC Distribution kits. The flatbed bodies divide the production in three series. The kit depicts the second type : it has the raised bed (the first type produced had it fixed directly on the chassis and the mudguards protruded in the body) and the high foldable sides (the third type had them lower). Dimensions are quite well respected. Closed bodies were used for a range of different special purposes truck variants. Standardized bodies, called Einheitskoffer or Einheits Kofferaufbau, were used for the vehicles that formed the very numerous family of the Kfz 305 which sub-variants are partially visible here. Other closed bodies were also used for the Kfz 51, the Kfz 61, the Kfz 62 and the Kfz 68. "Standard" meant the bodies could be mounted on any standard Wehrmacht 3 ton truck: 4x2 or 4x4 chassis (and on Maultiers). Sub variants had identical bodies (except for eventual production evolution changing). As far as I’ve seen, every one of these bodies were fixed directly on the chassis and had the rear wheels protruding in the floor and sides as for the 1st series flatbeds. Non standard closed wooden bodies were made in various styles and layout. 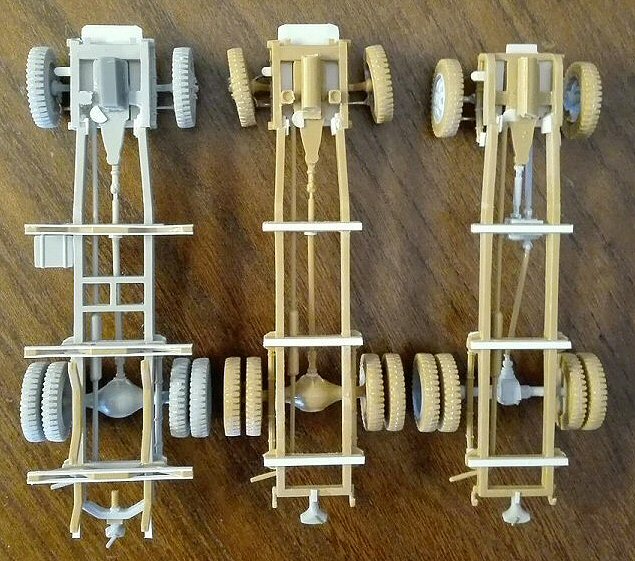 These were carried raised over the chassis, lying on the flatbed supports and clearly didn’t have the half-moon wheel housings (as for the 2nd and 3rd series flatbeds). In the photos I’ve seen some came without captions and I couldn’t know their specific role, others very likely were used as mobile command post workshop, kitchen or other. In almost every photo I’ve seen of a non standard body, the walls are made by horizontal planks, like little garden houses, and most had the lower wall part fixed to the floor as the flatbed sides. The variant proposed by Italeri should be the Sanitatsgeratekraftwagen Kfz 305/76, which had its specific features: two little doors and two windows on the left, a little door, window and a larger door on the right, a rear double door with the wide stairs and the skylight on the roof. Sanitatsgeratekraftwagen means transport of medical equipment. In theory, as far as I’ve found, this medical body should be mounted only on 4x4 chassis trucks (and on Maultiers). However a photo shows a Luftwaffe Blitz which looks to be a Kfz 305/76 (plate number WL12217) that is clearly a 4x2 chassis, suggests some exceptions or a very similar variant. I choose to depict a 1st series 4x2 truck, an early 3rd series 4x4 truck and a later medical 4x4 Kfz 305/76 in service in Normandy. • The front bumper is wrong. It was squared and solid to the mudguards. I filed off the plastic under the lower edge of the radiator. I glued a plastic sheet shaped in place and then I added 1x1 mm squared rod segments filed to the glued piece shape. • I opened the hole for the crank in the radiator. • The cab rear plate is 3 mm too high. I shortened the piece cutting the lower edge. • On the inner side I used stretched sprue for the “H” structure. • I divided the seats and replaced the single backrest by a shaped resin sprue segment. • About the interior, the dashboard placed as suggested stands too low and too close to the space for the legs of the driver and passenger. For a better effect I glued it just over its interlock, almost vertical. • I added the gear lever in the centre and the hand brake at its right by stretched sprue. The pedals are not visible and I considered adding them a futile exercise. 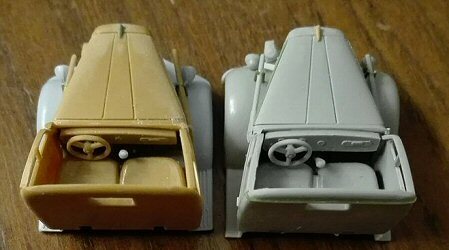 • To paint the interior before closing the cab I modified the assembly cutting the piece with the top and the dashboard. • I filled the ejector marks by cyanoacrylate glue. • Under the seats was the fuel tank, I made it in thick plastic. Thinner plastic sheet was used to close the spaces at its sides. • I closed the space behind the wheels by shaped plastic sheet. • The left side door required a bit of trimming to get them correctly in place. • I removed the areas under the doors. They weren’t flush and the gap is well visible. • I glued two thin plastic sheets to have the correct shape. The front was flush to the bonnet, the rear has a gap. • I added the Opel ornament on the top of the radiator by stretched sprue. • On the separation line on the bonnet sides I glued a thin stretched sprue segment to make a moulding. • The joint line between the rear plate and the top was made with thin stretched sprue. • I added the triangular device (signalling the truck is towing something) in neutral position in plastic sheet and stretched sprue. • The tool handles on the bonnets sides were fixed by two supports; I made them by stretched sprue. • I added the mirror using metallic wire and a plastic punched diskette. • The steps had two supports each. After having glued the cab to the chassis I made them by plastic strips. • I used the wheels filling the ejector pin marks with cyanoacrylate glue and opening the rear wheel holes. I know this make my models not really correct for a late production truck, sorry. 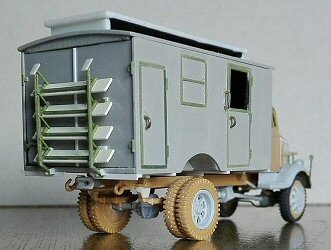 • As far as I found the longitudinal bars of the chassis had a slant that make them converging to the front from the cab rear (like in the Roden and in the smaller Airfix kits), this was a feature of the Blitz. 1/72 Academy, (as well as some 1/35 kits!) had them straight. I carefully cut the chassis just after the rear engine support (see below) and then I bent them gluing 0.5 mm inward. The measurement was obtained after having made a paper template of the forward chassis. The rear engine support flanges made by thin plastic sheet helped to strengthening the joints. I didn’t care for the engine area part because the metal sheet present on the engine sides and in front of this, hides the chassis so I could avoid further modifications. At the end the modification is barely visible and if one wants he could ignore it. • Under the rear part of the engine there was a curved transversal rod (see above). I made it by a 1x1 mm plastic rod segment. • As said, the engine sides were closed by two steel sheets; I made them using thin plastic. The originals had some vents that I didn’t add. A third piece closed the area forward of the engine. • To avoid possible transparencies, I shimmed the upper side of the engine. • There are two pins for the two spare wheel positions. Obviously on the original trucks the spare wheels were fixed differently. I cut them off. • The drive shaft wasn’t a single rod. It was composed of two sections joined at the first traverse after the cab. I glued a rod section for the support and divided the bar in two. The forward was horizontal while the rearward was inclined. • On one model I replaced the rear traverse rod by the Airfix one. On both chassis I added the towing hook by shaping a piece of sprue. • I added the steering rods made by metallic wire. • As far as I’ve seen, the forward tool box to be glued to the flatbed belly must be glued to the chassis. I lowered it and I closed its belly by thin plastic sheet. • The spare wheels were emptied by a motor tool and the holes were drilled open. 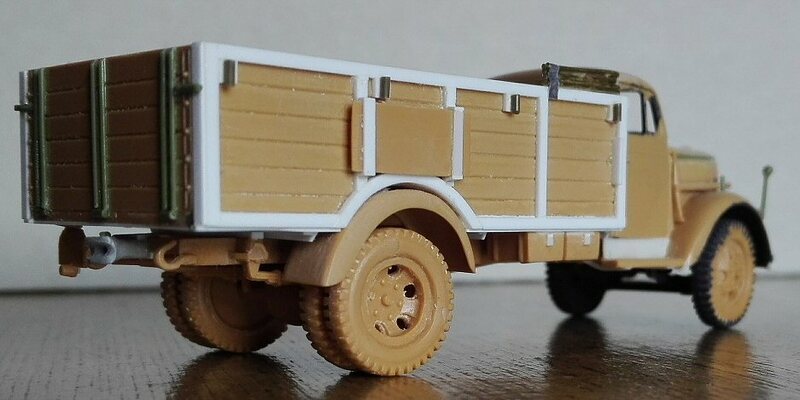 For the series 2 and 3 trucks and the non standard body box, it was placed on the chassis as suggested by the kit. To ease the painting I glued it on the flatbed belly. For series 1 and the standard body box it was carried by a simple structure under the chassis, between the rear axle and the towing hook. I made the structure using staples. • I used the floor of an “ambulance” kit, its interlocks holes were closed by plastic chips. It was narrowed on both front and rear panels to maintain the correct width, considering also the wider thickness of the sides due to their frame. • I glued the four sides. The lateral had the hinges sanded down and glued inside out. When dry I shaped the wheelhouse cut. • Just the rear side was foldable. I glued the frame on the sides using 1x0.5 mm plastic strips. • As far as I’ve understood, the 1 series had fixed benches. I depicted mine as to be used as cargo, so I imagined it with these removed. • On the sides, just above the wheels, I made by plastic sheet and strip the plate used to going over little obstacles. • I added also the tarpaulin frame interlocks by plastic sheet and stretched sprue. • Underneath I glued the rods that kept the floor planks together. The strips correspond to the transversal rods of the chassis. • Finally I added the lockers. • On the forward edge I stored the four elements of the tarpaulin structure, made by metallic wire. • I cut off the two upper planks to have the 60 cm sides (8.3 mm in 1/72). To these new sides I added the new spaced planks and their supports. I made this for three sides. Other options are the four sides made in this way or the forward side solid. • The fabric cover supports were stored on the front of the body. I made them by metallic wire and their housings by metallic strips. • The ends of the sides were closed by 1x0.25 mm segments. • The bed wasn’t composed of wood planks that magically stay together, under it there was a frame. I used the photos taken from restored truck, hoping for a well done job, because I didn’t find original photos of this part. I used 1x1 mm for the rods attached to the bed and 1 x 0.25 mm for the rods attached to the “W” elements glued to the chassis. Being solid in the real truck, for a better result an option could be filed off the upper millimetre of the “W” elements and replace the whole part with a 1 x 1 mm rod. • On the rear side I glued two 1 x 0.5 mm segments for the parts that went to the stoppers. 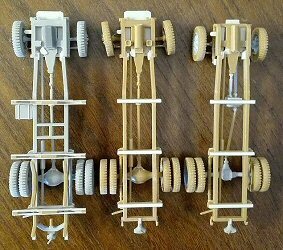 These were made in two parts, one glued to the bed frame (the supports) and the other to the chassis structure (the stoppers). • I added the hinges by stretched sprue segments, above them I enhanced their arms to which the planks were bolted by thin stretched sprue. The hinge arms were as long as the side height and kept the planks together, the kit ones are shallow so I glued stretched sprue to make them more conspicuous. • The locks were added to the body upper corners by thin stretched sprue and sheet segments. • The mudguards received their supports made by plastic strips segments. • Underneath the cargo bed there were two boxes (1a). They were lower than depicted. I filed them and made the inner support, while outer supports went directly on the frame. • I wished to model the benches. Unfortunately I had neither the correct measures nor a good photo to scale down. 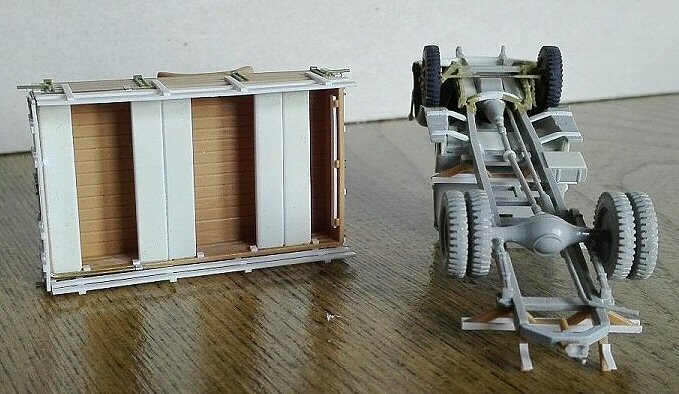 In the end I used the benches of the Dragon 1/35 as a reference, hoping this kit was correct (a modeller told me they are). They were removable, so they could be omitted if wished. • To the flatbed belly I added the spare wheel. It is fixed exactly where its place after having joined the flatbed to the chassis (where it should to be fixed) but here its easier to paint. As written above, the Kfz 305/76 should always have a 4 x 4 chassis. The problem is that the cab was different, having the mudguards shifted back and the bonnet looks longer (it wasn’t). The bumper which went from the radiator to the mudguards edge was bent more rearward. Some time ago I found this post , where is shown how the Italeri and the Airfix cabs are compatible, despite the declared scale being different. 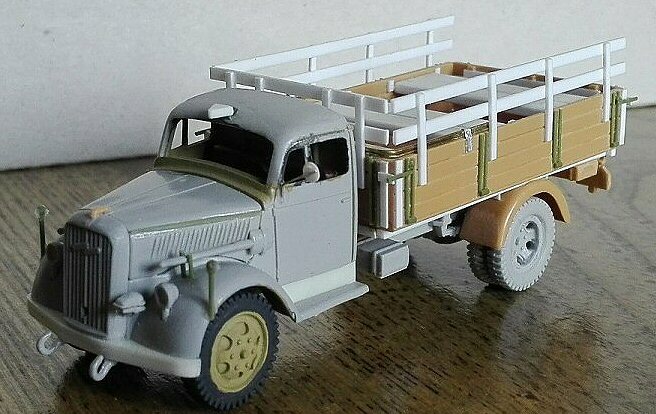 Although on the photos I’ve seen the Roden looked better, after having read the post I decided to use the Italeri kits because in this way my Opel trucks would have the same cab features and dimensions. • The floor of the engine area was cut off and the sides were filed straight to fit the Italeri chassis. • The hole under the radiator was closed by the forward part of the Airfix chassis. • I filled the ejector marks on the cab belly. • The belly is solid. I filed the rectangular hole for the tank and then I made it by thick plastic. • The vertical side of the step is doubled being present on both halves of the cab. I filed it on the lower half to thin it. • I fixed the cab firmly to the bonnet. When dry I filed off the crew compartment from the door forward edge on the sides and the bonnet top. 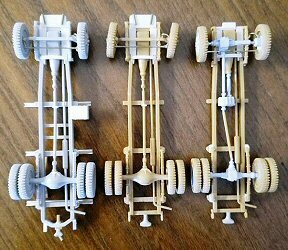 • I added the gear lever and the hand brake by stretched sprue as for the Italeri vehicle. A third lever was added on the left for the four wheel drive. Once more I didn’t add the pedals. • I made the Italeri cab, fixing it strongly to the crew compartment. When dry I filed off the forward part and under the doors on the sides and forward of the seats on the floor. • I replaced the single backrest by a shaped resin sprue segment. • On the bonnet front I glued the Italeri radiator, opening the crank hole and the Italeri Notek light. • On the bonnet I glued the Italeri top, after having shimmed it by 0.5 mm. • I erased the moulding on the bonnet sides, just over the louvers to round a bit more the bent line of the two swinging covers. The moulding was replaced by stretched sprue. • I replaced the dashboard and the steering wheel with the Italeri one, a bit larger. • On the rear I glued the Italeri crew compartment. • I also replaced the tools although the Airfix ones are well done. • The steps had two supports each. I made them by plastic strips after having glued the cab to the chassis. • The Italeri forward suspension springs were glued 2.0 mm backward. On them I glued the Airfix axle, widened by metallic rod to have the correct track. • The 4 x 4 chassis always had wheels with 8 holes and the Italeri ones have 6. The Airfix wheels are 11.8 x 2.3, but have 8 holes. However the rims have almost the same diameter, so I matched the Italeri tires and the Airfix rims on four of them, I kept the inner rearward from Italeri. Obviously I turned inside out the rear tires to have the surface free from the ejector marks. The rear couple was shimmed to reach the same Italeri couple width, 6.0 mm. I closed the eight holes of the forward wheels by a ring made of stretched sprue. • The front was adapted to the Airfix cab belly for the correct assembly. 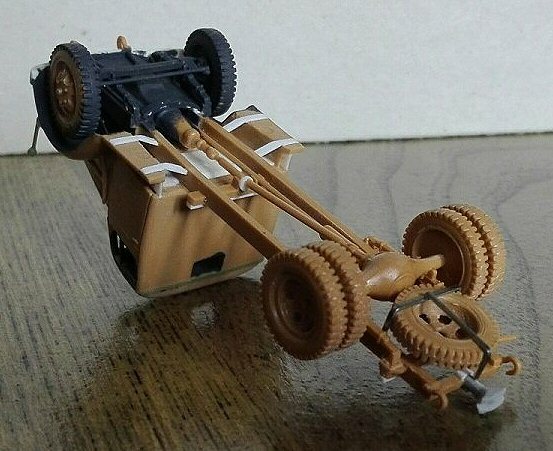 • The rearward suspension springs were shimmed by a 1 x 1 mm rod segment, shaped in place and then I glued the Airfix axle, which needed to be shortened to have the correct track. 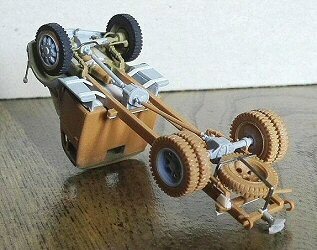 • On the second traverse I glued the Airfix gear box and to this the drive shafts. • I added the steering rods made by metallic wire. The transversal one was bent to avoid interferences to the drive shaft. • To get a reference point for gluing I made an interlock by plastic sheet just in front of the engine. 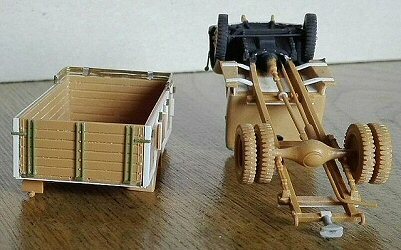 • The interlocks placed over the rear axle can be kept for a raised flat bed truck, but for the Kfz 305 bodies have to be erased (see below). • I had to raise the three transversal bars that stay behind the cab by plastic strips. • The Kfz. 305’s body boxes were fixed directly on the chassis and the spare wheel was placed as for the 1st type flatbed truck, so I cut off the mid length “H” support being unnecessary. Metallic staples gave me the material for the spare wheel housing. • The spare wheels were emptied by a motor tool and the holes were drilled open. • The proposed layout looks to be a mix between a standard box body (right side) and a non standard box body (left side). The windows are shallow and don’t respect the correct position and dimensions. I erased every detail and made them new by stretched sprue, sanded down when dry. To the doors I did also the hinges by stretched sprue and the curved handles by metallic wire. Two windows were opened to receive the transparent (made in packaging clear sheet) after the painting. • The air inlets were removed from the roof. • The skylight is very narrow and a bit short. I made a new one by plastic sheet and enlarged the slot in the roof. • I closed the interlocks for the rear swinging doors. • Under the belly there was a frame. I made it by plastic strips. • Two boxes were glued together and shaped to make the larger bins seen under the body at left. On the right side in different photos there was another box, a couple of smaller boxes or nothing at all. • The rear had a large stairs, missing in the kit. I had to scratchbuilt by plastic sheet and stretched sprue. Again the dimensions were taken scaling down some photos and keeping in mind Germans used metric measures. Just in the case one notes it : in the photo of my model the different lateral overhanging, strangely enough, while the supports were symmetrical, the steps weren’t, being shifted to the right. Truck WH536285_21st PzDiv. I didn’t find its particular photo, but got the very similar WH636289, 21st PzDiv at Derna, September 1942. It was a 4x2 series 1 with eight holes wheels, painted in dunkelgrau partially dirtied by dry mud. 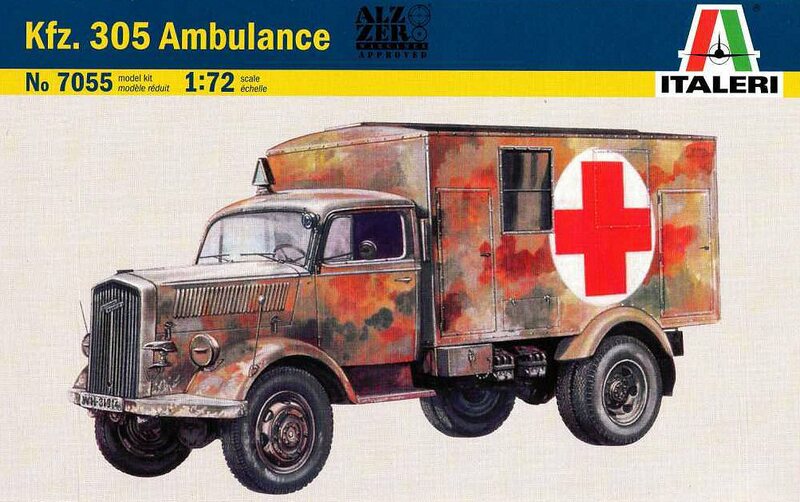 Ambulance WH235907_ 1st PzDiv, France, May 1940. I didn’t find its photo; anyway WH235807 was a dunkelgrau cargo bed truck. Ambulance WH1313526_2nd PzDiv, France, June 1944. This plate number was on a 4x2 dunkelgrau 2 series cargo bed truck. Although there are more modern Opel Blitz plastic kits, comparison reveals these old ones can still be considered quite good, less its weak points. The Roden kit, which I’ve just seen in the box, looked very good to me, while the Academy kit has the same wrong area under the cab doors, over sized radiator grille rods, solid flatbed supports and a very strange wheels layout: the front wheels have eight holes, the spare wheel and the inner rear wheel (hidden by the outer ones) have six and finally the outer rear wheels have no holes at all! The tires fall in the “no comment” category. After having seen this I left it on the shop shelf and avoided any further investigations. About the chassis, only Roden gave the correct layout, but the engine area hides the frame and correcting the Italeri chassis is quite easy. Fujimi has released what, on photos look to be good 1/72 kits, but honestly I’ve never seen them in the flesh. 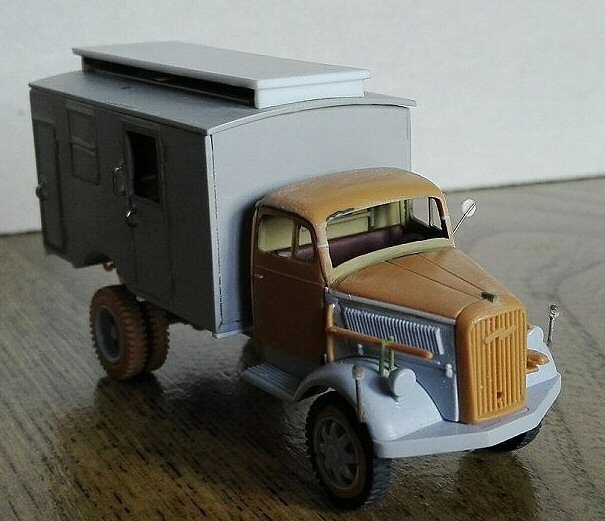 Italeri could add a third mould to give optional wheels and some of the missing details for the flatbed truck or give some interior for the “ambulance” or to have a different body house variant (radio, for example). 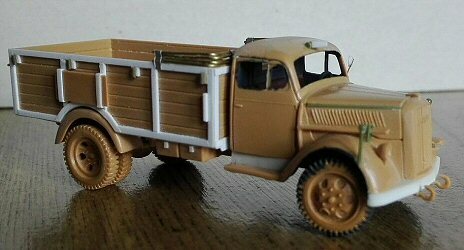 Nevertheless, I consider this kit still valid if you have some plastic strips and it is the only which have the six holes wheels for an early truck. 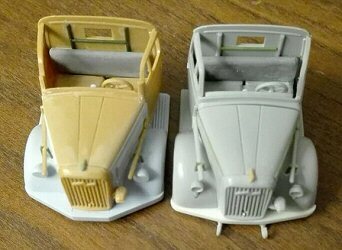 An update of the moulds would be welcome as well as more attention to the decal set.